Sanchez not going to Man U unless Mkhitaryan accept to move the opposite direction. Manchester United overtook rivals City for the signature of Sanchez, but the involvement of the Argentina born Armenia international have complicated the deal. 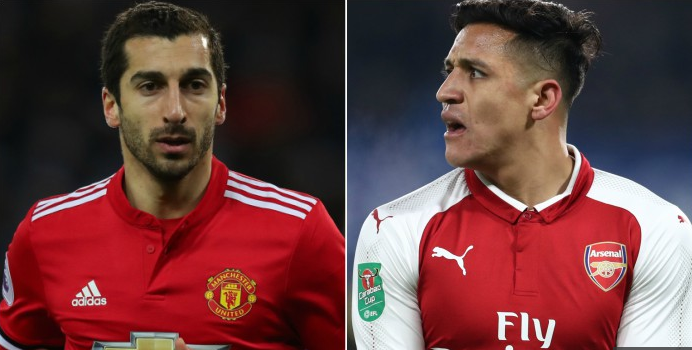 Manchester United, Arsenal and Alexis Sanchez have all agreed on both transfer fee and personal terms for the Chilean, however Henrikh Mkhitaryan reluctance to join Arsenal is holding the deal up. Agent Raiola claim is clearly an attempt to get out the best deal for his client and may be pushing this deal to the wire, a situation that may affect Arsenal’s ability to sign a replacement in time. A Chilean media reported last night 15th that a deal may be announced after the Stoke game, this did not happen, it turns out everything is down to Mkhitaryan’s nod. It was widely reported that Arsenal have reached an agreement with Malcom and Aubameyang is also a highly likely arrival with a possible Giroud plus £35m offer for the Borrusia Dortmund striker reportedly on the way. A last-minute resolution to the Sanchez / Mkhitaryan swap may impact Arsenal’s ability to close all the deals that have been pre-negotiated.